Eastern Europe is the eastern part of the European continent. There is no consensus on the precise area it covers, partly because the term has a wide range of geopolitical, geographical, cultural, and socioeconomic connotations. There are "almost as many definitions of Eastern Europe as there are scholars of the region". A related United Nations paper adds that "every assessment of spatial identities is essentially a social and cultural construct".One definition describes Eastern Europe as a cultural entity: the region lying in Europe with the main characteristics consisting of Greek, Byzantine, Eastern Orthodox, Russian, and some Ottoman culture influences. Another definition was created during the Cold War and used more or less synonymously with the term Eastern Bloc. A similar definition names the formerly communist European states outside the Soviet Union as Eastern Europe. Majority of historians and social scientists view such definitions as outdated or relegated, but they are still sometimes used for statistical purposes. Several definitions of Eastern Europe exist today, but they often lack precision, are too general, or are outdated. These definitions vary both across cultures and among experts, even political scientists, as the term has a wide range of geopolitical, geographical, cultural, and socioeconomic connotations. There are "almost as many definitions of Eastern Europe as there are scholars of the region". A related United Nations paper adds that "every assessment of spatial identities is essentially a social and cultural construct". While the eastern geographical boundaries of Europe are well defined, the boundary between Eastern and Western Europe is not geographical but historical, religious and cultural. The Ural Mountains, Ural River, and the Caucasus Mountains are the geographical land border of the eastern edge of Europe. In the west, however, the historical and cultural boundaries of "Eastern Europe" are subject to some overlap and, most importantly, have undergone historical fluctuations, which makes a precise definition of the western geographic boundaries of Eastern Europe and the geographical midpoint of Europe somewhat difficult. The East–West Schism (which began in the 11th century and lasts until the present) divided Christianity in Europe, and consequently, the world, into Western Christianity and Eastern Christianity. Western Europe according to this point of view is formed by countries with dominant Roman Catholic and Protestant churches (including Central European countries like Austria, the Czech Republic, Germany, Hungary, Poland, and Slovakia). Eastern Europe is formed by countries with dominant Eastern Orthodox churches, like Belarus, Bulgaria, Greece, Moldova, Montenegro, North Macedonia, Romania, Russia, Serbia, and Ukraine for instance. The schism is the break of communion and theology between what are now the Eastern (Orthodox) and Western (Roman Catholic from the 11th century, as well as from the 16th century also Protestant) churches. This division dominated Europe for centuries, in opposition to the rather short-lived Cold War division of 4 decades. Since the Great Schism of 1054, Europe has been divided between Roman Catholic and Protestant churches in the West, and the Eastern Orthodox Christian (many times incorrectly labeled "Greek Orthodox") churches in the east. Due to this religious cleavage, Eastern Orthodox countries are often associated with Eastern Europe. A cleavage of this sort is, however, often problematic; for example, Greece is overwhelmingly Orthodox, but is very rarely included in "Eastern Europe", for a variety of reasons, the most prominent being that Greece's history, for the most part, was more so influenced by Mediterranean cultures and contact. The fall of the Iron Curtain brought the end of the East-West division in Europe, but this geopolitical concept is sometimes still used for quick reference by the media or sometimes for statistical purposes. Another definition was used during the 40 years of Cold War between 1947 and 1989, and was more or less synonymous with the terms Eastern Bloc and Warsaw Pact. A similar definition names the formerly communist European states outside the Soviet Union as Eastern Europe. Historians and social scientists generally view such definitions as outdated or relegated. Eurovoc, a multilingual thesaurus maintained by the Publications Office of the European Union, has entries for "23 EU languages" (Bulgarian, Croatian, Czech, Danish, Dutch, English, Estonian, Finnish, French, German, Greek, Hungarian, Italian, Latvian, Lithuanian, Maltese, Polish, Portuguese, Romanian, Slovak, Slovenian, Spanish and Swedish), plus the languages of candidate countries (Albanian, Macedonian and Serbian). Of these, those in italics are classified as "Central and Eastern Europe" in this source. UNESCO, EuroVoc, National Geographic Society, Committee for International Cooperation in National Research in Demography, STW Thesaurus for Economics place the Baltic states in Northern Europe, whereas the CIA World Factbook places the region in Eastern Europe with a strong assimilation to Northern Europe. They are members of the Nordic-Baltic Eight regional cooperation forum whereas Central European countries formed their own alliance called the Visegrád Group. The Northern Future Forum, the Nordic Investment Bank, the Nordic Battlegroup, the Nordic-Baltic Eight and the New Hanseatic League are other examples of Northern European cooperation that includes the three countries collectively referred to as the Baltic states. The Caucasus nations of Armenia, Azerbaijan, and Georgia are included in definitions or histories of Eastern Europe. They are located in the transition zone of Eastern Europe and Western Asia. They participate in the European Union's Eastern Partnership program, the Euronest Parliamentary Assembly, and are members of the Council of Europe, which specifies that all three have political and cultural connections to Europe. In January 2002, the European Parliament noted that Armenia and Georgia may enter the EU in the future. However, Georgia is currently the only Caucasus nation actively seeking NATO and EU membership. Russia is a transcontinental country where the Western part is in Eastern Europe and the Eastern part is in Northern Asia. The term "Central Europe" is often used by historians to designate states formerly belonging to the Holy Roman Empire, the Austro-Hungarian Empire, and the Polish–Lithuanian Commonwealth. In some media, "Central Europe" can thus partially overlap with "Eastern Europe" of the Cold War Era. The following countries are labeled Central European by some commentators, though others still consider them to be Eastern European. Some countries in Southeast Europe can be considered part of Eastern Europe. Some of them can sometimes, albeit rarely, be characterized as belonging to Southern Europe, and some may also be included in Central Europe. 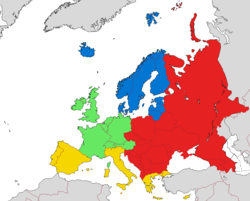 In some media, "Southeast Europe" can thus partially overlap with "Eastern Europe" of the Cold War Era. The following countries are labeled Southeast European by some commentators, though others still consider them to be Eastern European.